The European project is failing. It is time to consider a new theoretical model beyond the nation-state: smaller, localized communities, "habitat-nations", are the building blocks for a revitalized and democractic pan-European project. 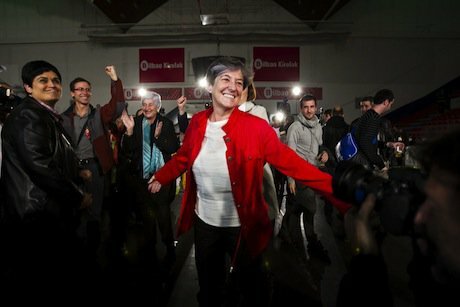 Laura Mintegi, leader of EH Bildu, the Basque separatist party that won big in this Sunday's regional parliamentary elections. Demotix/Manu Lozano. All rights reserved. Once again, history is humming a tune of change. Not many are yet listening to this different song, too busy with old hopes and with the deafening clash of power and wills on Europe’s political stage. Markets buzz with excitement every time a new bailout is announced, while bureaucrats hurry like diligent ants to work on the next victim's bones. The euro crisis seems to be all that matters now. Let Europe regain its financial stability and all will be well, so the politicians calmly say, as if they knew where they were going. All will be like it used to be, Europeans repeat to themselves, anxious about their savings as well as their debts. But as always, history does not quite follow the path that everyone thinks it will and has planned for. Back in 1989, when Europe seemed permanently divided into two antagonistic blocks and the borders of East and West appeared immutable, everyone was looking ahead to more of the same. However, change was already imperceptibly paving the way for a new world, albeit made of the same old and battered planks but nonetheless building distinctly new structures. What started as a muted hum, an almost inaudible rumour in the cold Eastern air, became a clamour sweeping across the continent that rocked the foundations of a Europe grown used to walls, bipolar summits and ballistic missiles. In the midst of walls collapsing and people celebrating in the streets, a new Eastern Europe was born. Borders were redrawn, political communities reunited, and the rusted structures that had been erected to last until the end of history crumbled and vanished like dust. Since the collapse of the Soviet empire, sixteen new European states have been created and many others have regained their freedom and independence. While most of these states emerged relatively peacefully, people are still very much haunted by the violent breakup of the former Yugoslavia. Now that all the fighting is over, however, there is little doubt that the whole region, divided into smaller and more cohesive states, is much more prosperous, more democratic and more stable than it ever was under Soviet rule. If it were not for the dead and the displaced, which perhaps might have been avoided if the international community had intervened more firmly and earlier, the remapping of Eastern Europe would be an unqualified success story. More than two decades later, the humming of history can be heard once again across the continent, but this time it is western Europe that is undergoing change. The financial crisis has set the stage for the much-needed liquidation of existing states built on the Westphalian model. The inhabitants of Scotland, Catalonia, the Basque country, Flanders, Venice, Lombardy, even Bavaria, aspire to live in a free and meaningful political community of their own. Just like Estonia, Lithuania, Slovenia or the Czech Republic, these small nations of western Europe, too long suppressed under the ideology of the nation-state and the overwhelming structures of competing large states, are demanding their rightful place in a brand new and different Europe. In spite of the inevitable doomsayers and fear mongers, the dissolution of the large states of Europe is not a drama to be dreaded but a momentous event to be celebrated as the inevitable evolution of the pan-European and democratic project. Excluding the area of direct Russian influence, Europe is currently divided into two very different blocks. Seven large states with an average of 50 million inhabitants comprise 50% of the territory and 70% of the total population of the continent. The remaining 50% of the territory and 30% of the population correspond to more than thirty small countries with an average population of 5 million inhabitants. This situation is seriously hampering the normal development of the European Union as the interstate institutions of governance are built on clearly asymmetrical political units. The current euro crisis is only the latest example of the inability of the pan-European institutions to solve the most elemental problems of a commonwealth. Everyone knows that Europe urgently needs a common fiscal policy in order to complement and stabilise its monetary union. But the power struggles between the large states are permanently deferring much-needed solutions, leading instead to unstable and partial compromises. Germany distrusts Italy and Spain; France fears Germany; meanwhile, the United Kingdom attempts to manage everything from a safe distance. It is just a variation on the geopolitical games that have driven our continent to disaster on so many occasions since the Treaty of Westphalia. As long as the large states remain in command of the European project, there will be no solution to Europe’s woes. I argue in my book, Habitat: The Ecopolitical Nation, that it is only by rebalancing the different units that make up the Union that Europe’s problems can be solved. The small European states could be combined into larger states following the Westphalian logic, but such an option, even if it were desirable, is clearly not feasible in practice. The only real solution is to break up the present large states into smaller, more cohesive and efficient political communities. If we truly want to pursue the project of building a united, stable and democratic continent, it is necessary to initiate the transition towards a new Europe of small nations, eliminating once and for all the concentration of power in the larger states. Rather than regionalising Europe, the aim should be to renationalise it. Such a project would not, however, be under the ideology of nationalism and the old model of the nation-state. Rather, it would be on the basis of ecologically and socially meaningful political communities, founded on the sustainability of cohabitation and on participatory democratic institutions. Such a process will never originate from within the existing European institutions, much less from the large states themselves. Neither will it emerge in the small nations that already have a state of their own and lack, therefore, clear incentives to promote sweeping changes, even though they would certainly benefit from supporting the rebalancing of the geopolitical map of Europe. It is only the small nations that are still integrated into the large Western states for a variety of historical and political circumstances that will be able to initiate the process that ends up transforming the old Europe of nation-states into this new Europe of what I call habitat-nations. All Europeans should endorse the independence of the small western nations, such as Scotland, Catalonia, Flanders or the Basque country, with the capacity to rapidly evolve into cohesive and dynamic political communities. Support should not only come from the small sovereign countries or nations that aspire to independence, but even from the large states from which they would like to separate. It is not a question of dividing territory, but of creating new, more inclusive and democratic political communities. Despite their role in the process of modernisation, large states are no longer able to offer a framework of cohabitation and prosperity, much less of solidarity. While the small nations of Europe advance towards wellbeing and social justice, the large states founder like old Diplodocuses in the swamps of globalisation, hardly able to sustain themselves with their trappings of power. It is difficult to understand why any European would want to live today within the borders of a large state when it is so obvious that a community of free inhabitants can only evolve in the context of a small nation. Even those who hold fast to the dreams of a universal democratic community or to the idea of a single great European state should realise that a politically unified Europe will never be a democratic Europe. At best, it will be an extended regime of rights and duties, built on the idea of a European citizenry that is as fictitious as the bridges depicted on the euro notes. The only framework that allows for a sufficient level of political participation is the ecologically and socially meaningful community, the habitat-nation. And only a Europe of habitat-nations, integrated in a balanced and equitable confederation, may be able to fulfill the aspirations of those Europeans who dream of a more united and democratic continent. The collapse of the Soviet Union and its satellite states was not expected, even if, in hindsight, it seemed almost inevitable. People tend to forget that change happens precisely when everyone is looking somewhere else. We might be experiencing, without yet fully realising it, another fundamental historical transformation. If one is attentive enough, the humming of history can be distinctly heard in the streets of Barcelona and Glasgow, in the coffee houses of Bruges and in the narrow lanes of Venice. The song is still faint, but new voices are joining in every day. Soon it will be so loud and clear that no one, not even the guardians of the old Westphalian orthodoxy, will be able to ignore it. A new and better western Europe is asking to be born.